“What do you call a blind dinosaur?” You’ve probably heard that one, but if not… sorry. This is another from my series in the flooded Rickmansworth Aquadrome. 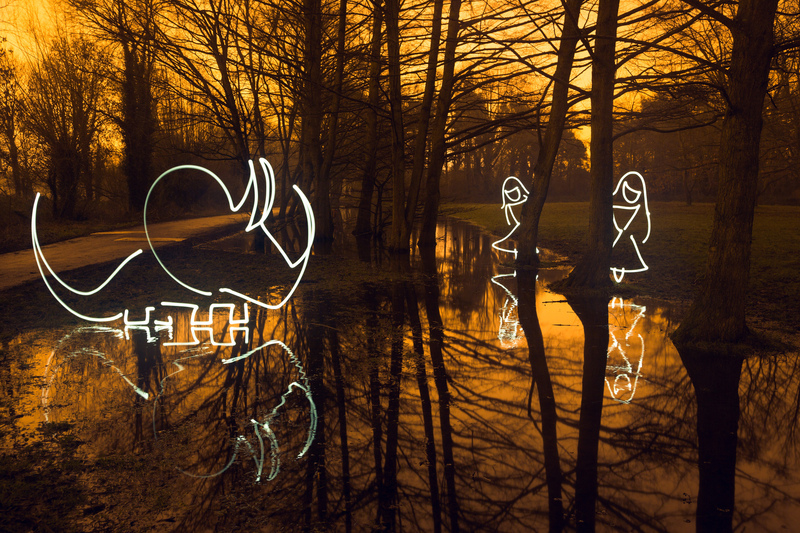 When I started light painting, I tried to draw painstakingly unique, perfect images for every scene I saw. It ended up that I shot very little, as it placed a huge burden of time and learning on every shot. This summer I decided to focus on a few key characters, and building my repertoire from there. For some reason the pinup girl and triceratops are easiest for me to draw, and I’m really enjoying being able to shoot more often. Thanks to everyone who Flickrmails me with questions about light painting – hopefully my answers have helped. I’m in the process of writing an article on the subject for (the excellent) Photophique which I hope to share soon. My main advice is to get out there – I promise you that it is way, way easier than it looks and you’ll get great stuff right off the bat. Hope everyone is having an amazing week, and apologies for my slow catch up on Flickr at the moment. Work is busy… but I’m getting round slowly! Please tell me how did you place the dino right in the middle of water? And how did you get such perfect figures. Did you use a predefined cutout or is trial an error.. Please do reply.. as I want to learn..I am just a beginner. Hi Shantanu – thanks for the great questions! In terms of putting figures in water it’s either Wellington boots in winter or Crocs in summer! You have to move slowly and with care especially in small puddles to make sure the ripples and waves don’t distort the reflection too much – unless that’s what you want. In terms of precise lines I don’t use cutouts, though it seemed like a good idea at first I thought I’d try it free hand first. You’ll find it easier than you think! You will make mistakes, but pixels are free and so you just practice! I’ll be sharing some light painting tutorials here, so will be sharing tips in the near future. Nice work – commented over on your blog! Have a great start to the week!